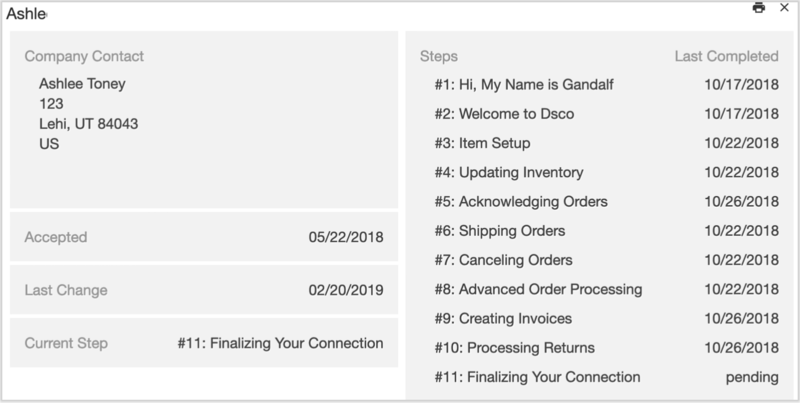 Dsco provides retailers with a valuable look at where each of their trading partners fall in the Gandalf testing flow, allowing visibility into the progress and speed of onboarding. One of the stand out features of working with the Dsco platform is our online onboarding guide, Gandalf. Gandalf guides new accounts through all the needed testing and verification to get trained on Dsco and prepare for live data with their trading partners. As retailers are typically deeply involved in the onboarding process of their trading partners, with speed and accuracy of the testing being vital, Dsco provides insight on the testing progress of each partner. When logged in with a retailer account, and then inside the TRADING PARTNERS page is a tab titled - ONBOARDING. There, the overview page will display details of Status (invited, onboarding, and connected), Substatus (the current step each partner is currently working with), Created, Last Change, and the Go Live Date. The go live date is entered and set when the invites go out to the trading partners. To get further detail, click on a partner name and a full history of each step and when it was completed is available. A full file download of all the onboarding progress is also available on this tab. On the top right of the screen, click on Download All Results to download the file.